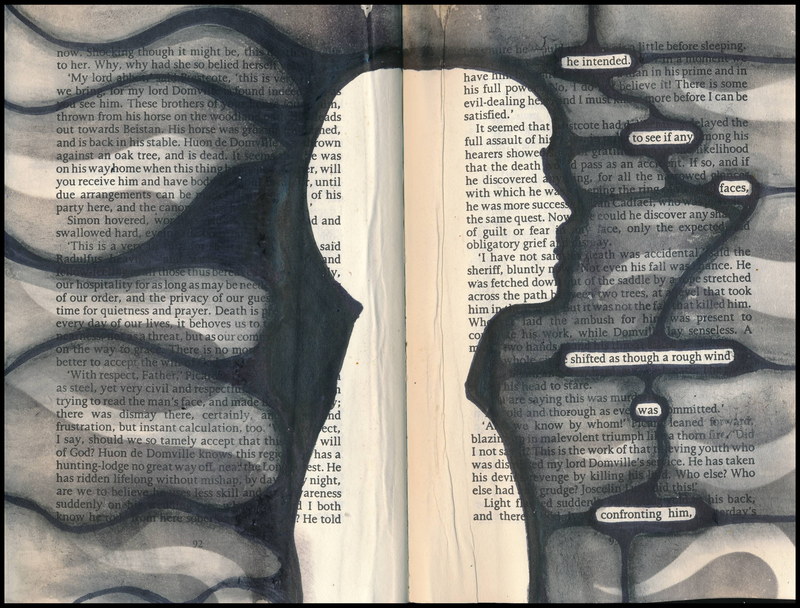 I made this art journal page today, inspired by many of the “blackout poetry” examples I have seen on Pinterest. I started by circling words on the page that could be joined together to make a sentence — using pencil at first, so I could erase false starts. When I had chosen the words I would use, I outlined them with a black sharpie. As I thought about the meaning of the words (“He intended to see if any faces shifted, as though a rough wind was confronting him”), I wanted to portray the idea of WIND blowing onto a FACE. I traced a silhouette from a found image onto the page, and used a black watercolour pencil blended with a watery paint brush to fade the colour away from the words and image. I used a stencil, blending tool, and gray Distress ink to provide light and mid-tone tongues of wind. This was a fun experiment! I look forward to trying other forms of blackout poetry in the future!